The last time I wrote on Creative Late Bloomers, dated 10/10/16, I entitled the post "The Last Book, The Last Lecture, The Last Chapter: Lessons in How to Live." I talked about three books: Oliver Sacks' last book called "On the Move: A Life," "The Last Lecture" by Randy Pausch, based on the final lecture given by a 47-year-old computer science professor who had metastatic pancreatic cancer and the then 98-year-old Diana Athill, author of "Somewhere Near the End," who miraculously had written another yet another book delightfully entitled "Alive, Alive Oh!" The authors of those first two books already had died when their books were published. Athill turned 100 last December. That last post was prompted by the fact that my eldest sister Joan had recently received her own diagnosis of matastatic pancreatic cancer, so lessons of life and death were very much on my mind. Just after my "last book, last lecture" post, I visited Joan in Milwaukee. I returned to visit her again in January, 2017. She died at the end of February, 2017. During my Christmas visit, Joan was lively and hopeful. With my two other sisters, we helped trim her Christmas tree, pawed through the final boxes left after my mother's death that Joan had stored in her attic, went to see "La Cage aux Folles," accompanied Joan to her chemo treatment, enjoyed an evening of cabaret music, had several dinners on the town and spent an afternoon pampering ourselves at a day spa at the Pfister Hotel. In between all this frenetic activity, I drove Joan to Marquette University where she was still work at the College of Education. She was the oldest of us four sisters, but the only one who hadn't retired. 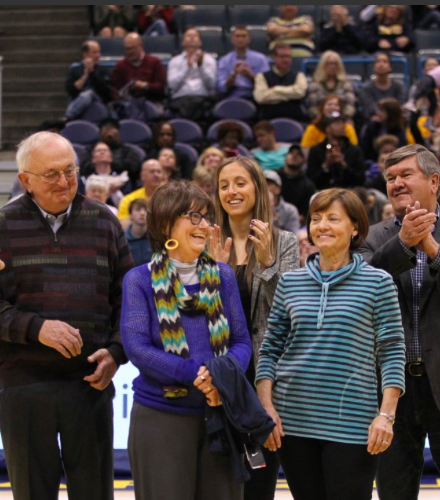 There she is, at right with the jazzy scarf, surrounded by her family, getting an award as a Marquette University Faculty All-Star in November, 2016. So why am I returning to this blog now? No one else has died (yet) or is dying (although, of course, we all are). I'm back because I've read another book about life and death that I want to recommend. It made me sad to think that Joan never made it into the category that author John Leland addresses -- the oldest old (people over 85) -- but that during her illness, she acted very much like the people Leland followed around for a year. They had nothing in common with the over-achievers I have heralded on this blog -- people, as Leland puts it, like the "remarkable old lady who seems to defy aging altogether, drinking martinis and running marathons in her nineties" nor do they dwell on the declines of their bodies and minds. They merely savor the little moments that are left in their lives, the days they can get out of bed despite their aches and pains, the days they win at mahjong, the days they hear once again a favorite opera recording. These elders that Leland, a reporter for the New York Times, spent time with, like the vast majority of older people, didn't fit the stereotypical story lines of the elderly as victim or the elderly as super hero. Like Joan did, they were living life as fully as they could, no matter what their circumstances. 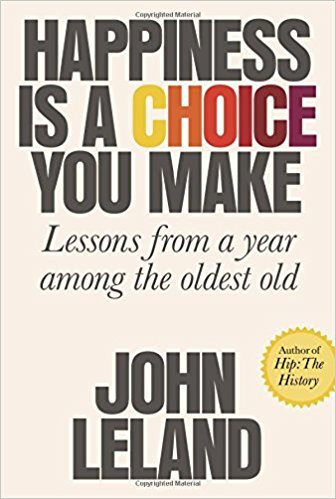 "They lived with loss and disability but did not define themselves by it," he writes of these oldest old, "and got up each morning with wants and needs, no less so because their knees hurt or they couldn't do the crossword puzzle like they used to. Old age wasn't something that hit them one day when they weren't careful. It also wasn't a problem to be fixed. It was a state of life like any other, one in which they were still making decisions about how they wanted to live, still learning about themselves and the world." I may still be inspired to post about an octogenarian marathon runner, but for now, I'm going with being happy I can finish the New York Times Saturday crossword puzzle. The title of this post, BTW, is inspired by a clue I solved from the November 25, 2017 New York Times puzzle. Clue: Brief comeback. Answer: Are not.